The article below originally appeared in a comment I posted in Facebook under a link in the BBC page there to an article appearing in its own website here. I have expanded/modified my original Facebook comment somewhat. The BBC has recently been forced to publish the salaries of all 'stars' being paid £150,000 p.a. or more, and this has confirmed what had only been strongly suspected before - wide differences between the remuneration paid to different people for doing what seem to be very similar work, with the differences being based on gender (men generally being paid more) and/or ethnic origin. Gender inequality is wrong, so my suggestion is to lower all the salaries of the male so-called "stars" until they are similar to those of the females whose jobs are similar or indistinguishable from what they are employed to do. Some of the higher female salaries could be reduced too. If any of them (male or female) are not happy, they can I'm sure try to offer their talents instead to commercial networks in the hope of being paid more. I imagine their contracts come up for renegotiation every few years - BBC management need to learn how to manage and husband its guaranteed revenue stream more wisely, via the mandatory licence fee it is privileged to receive. I rarely watch or listen to any of them (in the case of Chris Evans after his disastrous reboot of Top Gear), nor indeed many of those already on commercial networks also reputedly paid large sums, so it really will make zero difference to me. Best of all, abolish the licence fee and replace it with subscriptions for those that wish to pay them, or take advertising. The BBC lost its way many years ago and while some aspects of it remain good, it does need a radical overhaul or outright replacement. If religion hadn't historically tried to impose its will on society, often by physical force and often by social pressure (very often even more powerful in controlling a gullible population), sceptics wouldn't be so fearful of the menace it has too often represented when it gains the upper hand. Tim Farron [may feel he] has been harshly treated or at least "misunderstood", and to a certain limited extent even I, as a gay man, would tend to agree that he has, but one cannot divorce what has happened from the historical context of how religious dogmas have always behaved if they thought they could. It's not so long ago that one of the country's greatest heroes (Turing) was chemically castrated, because at that time merely being homosexual was a crime, largely based I would argue on the influence of the Christian religion in framing the country's laws then, and now another of these wacko religions (Islam, lest there be the merest scintilla of doubt to what I refer), because it can, is throwing gay men off of buildings, and consigning women to slavery. To be clear, I don't think Tim Farron is any kind of danger as an individual, but the kind of thinking his beliefs represent, if they had the upper hand, petrifies me. So Tim Farron has taken the, in my view, somewhat petulant decision to stand down from the Leadership of the Liberal Democrat Party and ended with the jibe that this is because the country is not truly 'democratic', nor 'liberal'. This is nonsense. The harsh reality is that a significant proportion of the population in many of what are self-described as "advanced societies" no longer 'believe in' nor are prepared to be dictated to by religion. If he had clearly said what his own personal views/beliefs are, when asked about it, but that this would not be used to influence his views on public policy, I think that would have defused the matter completely, indeed his own voting record in Parliament is pretty "respectable" in this regard. Instead however he repeatedly shied away from simply stating what his views are. So he has been somewhat harshly treated, but his own reaction to the pressures he has felt he has faced have been "sub-optimal", to put it mildly. And so he "exits stage left" from the political stage of party leadership. NB/ I have deliberately avoided touching on his views on 'Brexit', by the way (about which he never stopped speaking); if he had been similarly open about his views on certain aspects of his religious beliefs, I do not think he would have landed up in this dilemma of his own making. This is a follow-on post from the 'candidates' article I wrote here on 12 May 2017. Scottish Christian Party "Proclaiming Christ’s Lordship"
- The sitting Scottish National Party MP, Drew Hendry, has been re-elected, but with a significantly reduced share of the vote (down 10.2% at 39.9%). The Conservatives have dramatically increased their vote, switching from 4th position in the 2015 election to take 2nd position from the Liberal Democrats, with 30.5% of the vote (up 24.6%), who themselves now occupy 4th position with a very significantly reduced vote (down 19% at 12.3%), whilst the Labour Party remains in 3rd position, although with a somewhat increased vote at 16.2% (up 8.7%), from a pretty low starting point. The source for all the results information here is in the BBC Election 2017 'micro-site' here - click on the 'Constituencies' link near the top of the page and from there you can find full results information for all constituencies - you can also scroll down any constituency page to find the results at the previous General Election in 2015. There is to be a General Election across the whole of the UK on 8th June 2017. - Ross, Skye and Lochaber (RSL). Because of the low population densities in most parts of the extremely large Highland Council area, the three parliamentary constituencies each cover quite large geographic areas too. In addition and because of its proximity to the east of the Highland Council area, I have decided to cover the Moray Council area for this election, which has one parliamentary constituency for Westminster elections, namely Moray, nice and simple. This article indicates no particular political preference for any candidate - it is intended to be purely factual and "neutral" and is published for my own reference over the coming weeks and in the hope it may be useful for others; because of the unexpected nature of this election, some relevant websites have not [yet] been updated to show important information, but one can expect the larger media outlets to "catch up" in coming days, meantime I have relied solely upon the official websites of the two council areas where the four constituencies I refer to here are located. In other articles I am likely to publish in coming days, my own political leanings, and recommendations for voting, will be made clear. Those who are familiar with my blog, or who happen to know me personally, will already know what my own views most probably are of course. - The website of Highland Council is here and its election page can be viewed here, and all details are either in that page, or in linked pages from there. - The website of Moray Council is here and its election page can be viewed here, and all details are in various linked pages from there, for candidates in the .pdf page here. Overall an excellent result for the Conservatives throughout Scotland and in my local government area - Highland Region - a pretty good result too, in fact an amazingly good outcome from a very low starting position for the party in Scotland. In Scotland overall, though, let's not kid ourselves, the SNP retains the largest number of seats, albeit suffering a small loss in numbers of seats (-7). However, and pleasingly, it is Labour that has lost the most (-133), as have "Independent" (-26) and the Liberal Democrat (-3). Two groups have gained seats - Conservatives (+164) and Green (+5). The Conservatives have gone from 4th place to 2nd place in numbers of seats, overtaking both Labour, quite extraordinarily, and "Independent". You can see full results for Scotland here. As for Highland Council, where I live, there are 74 seats in all, and the Conservatives have increased from a standing start of "zero", to take 10 seats, really very good indeed. You can see summary details with changes in the BBC website here. In the Highland Council website you can see full summary seat holdings after all results have been declared, plus details for each Council Ward of which candidates have been elected - visit its website here. More detailed voting information for Ward 18 - Nairn and Cawdor is available in the Highland Council website here, from which two .PDF files may be downloaded, yielding what to me is the extraordinary and pleasing result that, looking at 1st Preference Votes alone, the Conservative councillor Peter Saggers was second only to one of the Independent councillors Tom Heggie, both newly-elected at this election. The other two councillors elected were both re-elected, having been councillors in several previous councils. What is even more extraordinary, and pleasing to me, is that the re-elected SNP councillor Liz MacDonald in fact came 4th in 1st preference votes, whereas the other re-elected Independent councillor Laurie Fraser came 3rd in 1st preference votes. The two councillors who were not re-elected, but had been councillors upto now were Stephen Fuller and Michael Green. Finally, for the parts of the UK which had local elections yesterday (much of England, all of Scotland and Wales), you can see full results here, but although all results have already been declared in England, Scotland and Wales, there are parts of England for which there are different procedures so are not incorporated into the linked BBC page because they now have Mayoral elections instead, and you can find those results here, however results in two Council Mayoral elections are shown separately in two separate pages - these are Doncaster (result here) and North Tyneside (result here). NB/ Please remember that there are parts of England where the election-cycle did not fall this time, as is the case with the whole of Northern Ireland. ADDENDUM (Friday 5MAY2017 23.56 BST) I have now re-visited the Highland Council page already linked to above, but for the sake of convenience I repeat it here, where there is now another very interesting document in .PDF format to download, entitled "Candidate Votes Per Stage Report" which details how eligible votes evolved stage by stage until the quota of four elected councillors was arrived at. There is a further report also in .PDF format called "Transfers Report" which analyses in detail how this process evolved. Finally there is another report in 'raw' .CSV format called "Preference Profile Report Ward 18 Nairn and Cawdor" which provides further detail for those interested in a further level of analysis (if you haven't already thrown away your "Poll Card" you can see how your own votes were recorded in the system by checking against your own "Number on Register" by scrolling down the 4-digit reference in the left-most column of this .CSV report, although I suspect that the digits which follow have been further 'randomised' for added security, after re-examination of my own preference votes). I first became aware of this via a Facebook page I follow, but think it requires a mention here too, specially as we are only three days away from local government elections in Scotland, when we all have a chance to reduce the presence of the SNP, if not 'send them packing' entirely (my preferred option). The Scotsman has now published Alex Salmond's letter in a separate "rebuttal" article and you can read what it says here. You can also read the original article, written by Euan McColm to which Mr Salmond has taken exception, by clicking here. Nothing in Mr McColm's article is, in my opinion, any way intemperate, or "over the top", indeed I think it goes out of its way to present both sides of a very contentious debate. Golly, his ego is so huge he can't take a bit of honest commentary! This is the guy who tried to bluff his way through an interview with Andrew Neil only this morning and Andrew wasn't taking any of his nonsense either (* - see at end). He is divisive, it's what a lot of people think, amongst which I'm happy to count myself. I am totally cheesed of with this narcissist. He tried to imply in his silly letter that the criticism of him by McColm was merely as a proxy for covert commentary on Sturgeon, but in my opinion he deserves plenty of obloquy directed at him personally, both for his performance as First Minister, and perhaps even more so since he stepped down and has behaved in increasingly quixotic and erratic ways. Obviously I can't see into the author's mind, but in my opinion there's plenty of justified criticism to share between both Salmond and Sturgeon and the rest of the SNP 'cult' in government, including the completely useless John Swinney and Humza Youssef, and they're just the names that immediately pop into my head, because there are many more incompetents in that crowd of shysters to choose from for a tongue-lashing. Finally, whilst the SNP have successfully stifled dissent amongst their own members, officials, elected people and supporters, Scotland is not yet a "one party state" and until they are mad enough to try and make dissent illegal, people like me will not hesitate to call these obsessives out on their many and varied deficiencies, not least for the incompetent way they have run the Scottish Government since they managed to bamboozle the Scottish elecotrate into voting them into power. Golly, how I loathe these people! Keep Scotland British! You know it makes sense! When voting in the Local Government Elections on Thursday 4th May 2017, if you are in Scotland, please use your voting choices by voting for "Anyone but SNP", whilst avoiding voting for the Greens, or any "Independent" council candidate who has a record of supporting the SNP/Green "Scottish separation/indpendence" agenda, preferably using at least one of your preference votes (as high up in your list of preferences as possible), by voting Conservative . 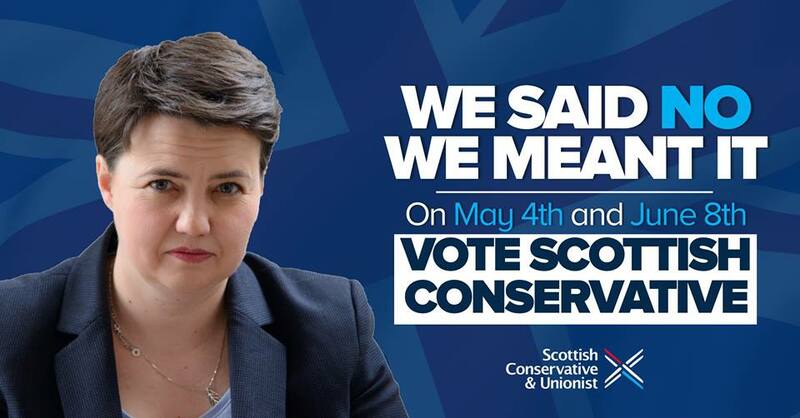 Wherever else you are in the UK (if not in Scotland), I similarly urge you to vote Conservative in next week's Local Government Elections too. After the final push for next week's Local Government Elections, we voters have a few weeks of respite before returning to the voting booths again on Thursday 8th June to vote in the General Election, when it is doubly important, for those of us in Scotland, to reduce the representation of the SNP at Westminster as much as possible, either by voting for the political party you favour personally (Conservatives in my case, or Labour, LibDems or even, at a pinch, UKIP), or by voting "tactically" for another political party which seems likely to do well in your own constituency - all to maximise the chances of defeating and ejecting sitting SNP MPs. The Spectator magazine has a useful article here to assist you in how best to deploy your "tactical vote" in Scottish constituencies for the Westminster election on 8th June to have the maximum anti-SNP value. The Scottish Greens are allied with the SNP in aiming to split the UK asunder too, so wherever you are please don't vote for them either. 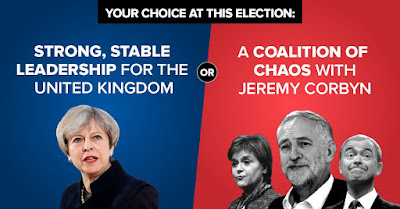 If you are elsewhere in the UK, in England or Wales, I urge you to vote vote Conservative, to unseat as many Labour and LibDem sitting MPs as possible; in Northern Ireland please show your support by voting for a political party which supports the UK. Help to re-elect a Conservative Government! Just five weeks after the upcoming Local Government elections on 4th May, we will be having a General Election in the UK on 8th June. 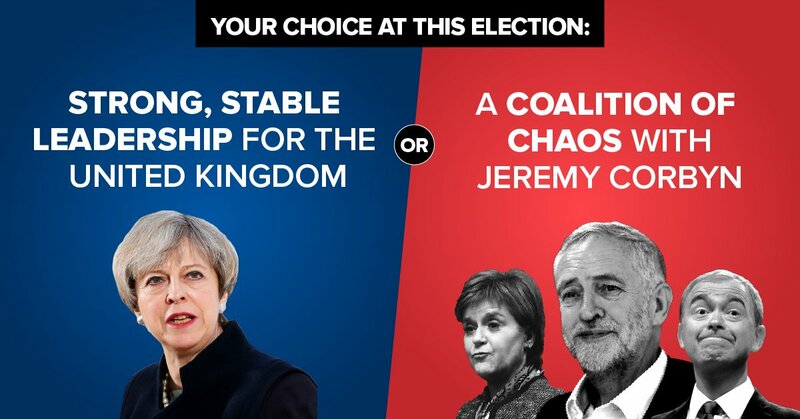 Do you want the sensible, rational policies offered by the Conservatives, or do you favour a shambolic government by a very left-wing and dysfunctional 'socialist' Labour Party, either alone or in coalition with its fellow-travellers on the left, the SNP and the LibDems? Vote Conservative! You know it makes sense! Local Government Elections are being held throughout the UK (except NI) on 4th May and a General Election is being called for 8th June throughout the whole of the UK. 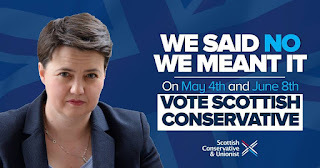 Wherever you are in the UK, I urge you to vote Conservative in the General Election and if you are in Scotland, when voting in the Local Government Elections please use your voting choices by voting for "Anyone but SNP", whilst avoiding voting for the Greens, or any "Independent" council candidate who has a record of supporting the SNP/Green "Scottish separation/indpendence" agenda.